The boys take a few minutes from scrambling talus to warm themselves in the glow of 10 million years of batholithic uplift. We arrived the previous evening with just enough time to hike up to one of the ephemeral waterfalls near Yosemite’s entrance, but they couldn’t keep up with me when I climbed up to the base of the falls. At the the lower Yosemite Falls above, they were able to get much closer. Close enough to scare the tourists. Starting 10 million years ago, vertical movement along the Sierra fault started to uplift the Sierra Nevada. 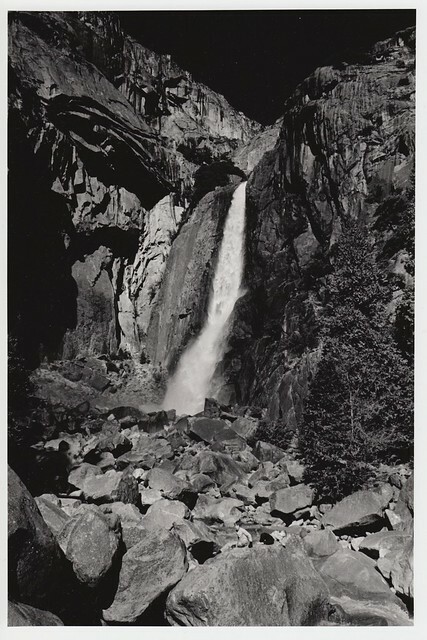 Subsequent tilting of the Sierra block and the resulting accelerated uplift of the Sierra Nevada increased the gradient of western-flowing streams. The streams consequently ran faster and thus cut their valleys more quickly. Additional uplift occurred when major faults developed to the east, especially the creation of Owens Valley from Basin and Range-associated extensional forces. Uplift of the Sierra accelerated again about two million years ago during the Pleistocene. The uplifting and increased erosion exposed granitic rocks in the area to surface pressures, resulting in exfoliation (responsible for the rounded shape of the many domes in the park) and mass wasting following the numerous fracture joint planes (cracks; especially vertical ones) in the now solidified plutons. Pleistocene glaciers further accelerated this process and the larger ones transported the resulting talus and till from valley floors. Numerous vertical joint planes controlled where and how fast erosion took place. Most of these long, linear and very deep cracks trend northeast or northwest and form parallel, often regularly spaced sets. They were created by uplift-associated pressure release and by the unloading of overlying rock via erosion.